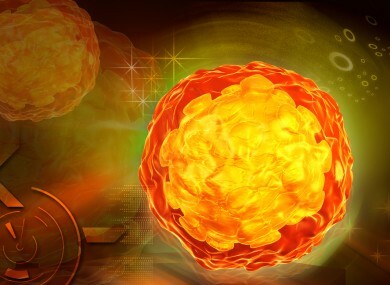 Digital illustration of Polio virus. TWO INFECTIOUS DISEASE experts have warned that a new outbreak of polio in Syria recently might endanger neighbouring regions, including Europe. The outbreak of the disease was confirmed by the World Health Organisation in October. Writing to the journal, The Lancet, the two experts said Professor Martin Eichner, of the University of Tübingen, and Stefan Brockmann, of Reutlingen Regional Public Health Office, in Germany, said that most European countries today use inactivated polio vaccine (IPV) rather than oral polio vaccination (OPV), which has been discontinued in most areas due to rare cases of it causing acute flacid paralysis (AFP), the main symptom of polio. In Europe, where the circulating polio viruses have been eliminated for decades, transmission can only be prevented by IPV if vaccination coverage is continually very high and if the population has high hygienic standards and low crowding, they explained. As large numbers of refugees are fleeing Syria and seeking refuge in neighbouring countries and Europe, they said there is a risk that the virus could be reintroduced into areas which have been polio-free for decades. The two experts warned that areas such as Bosnia and Herzegovina, Ukraine and Austria, where vaccination coverage is low, could be most at risk. “Immunity may be insufficient to prevent sustained transmission if the polio virus is reintroduced into the community,” they stated. Tübingen and Brockmann speculate that the virus might circulate for nearly a year before a single case of AFP arises and an outbreak can be detected, even though by this time hundreds of individuals might carry the infection. They said that the oral polio vaccination provides high protection against acquisition and spreading of the infection, but this vaccine was discontinued in Europe because of rare cases of vaccination-related acute flaccid paralysis. They warned that only some of the European Union member states still allow its use and none has a stockpile of oral polio vaccines. They said that routine screening of sewage for poliovirus has not been done in most European countries, but said there should be intensified surveillance measure considered for settlements with large numbers of Syrian refugees. Email “Experts warn that the polio outbreak in Syria may threaten Europe”. Feedback on “Experts warn that the polio outbreak in Syria may threaten Europe”.